The other evening we had an unexpected round of violent storms. For most of the day, the local forecasters were saying we’d get some rain, and maybe some lightning and thunder, but even they were caught off-guard by the suddenness and fury of the storms. I’m a little bit of a weather nerd; if someone in my family wants to know what the long range forecast is, they ask me. Ditto for humidity, what to pack when traveling to ________, etc. It’s a science-y thing. Or maybe just it’s easier to pay attention to weather so I know how to plan my week around mowing, weeding, or washing the dog. Honestly, if the freshman science requirement had allowed meteorology to fit into my schedule instead of geology, my life might have taken a different path. Since I harbor secret meteorological leanings, I have a couple weather apps on my phone; one sounds a siren when severe thunderstorms or tornadoes are imminent. So we hunkered down. And were safe. We lost the power, and the video to our son, but we were safe. I think everyone in our community is safe, but some homes, outbuildings, and trees are not. I don’t think we had a tornado, but the wind was so very, very fierce. 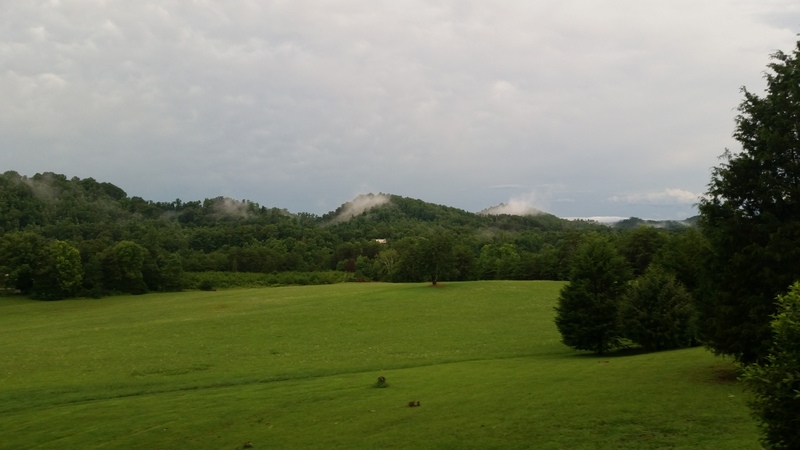 Afterward, my husband and I went out onto the front porch, and the view was incredibly beautiful. Green. Lush. Wisps of clouds floating through the mountain knobs like an elephant parade at the circus. I once heard someone say that if you pray for something and it comes to pass, never forget to pray back to God in gratitude for the answered prayer. Like I do when things are dicey, I prayed for us to all be safe during these storms. And when we came up from the basement and saw the picture-perfect beauty that God left for us afterward, I whispered a prayer of thanks. Why is it sometimes so easy – while you’re in the middle of a storm – to remember that after the squall, the world once again sparkles? It’s easy to lose sight that on the other side of the tempest, there is quiet.